This secluded oasis is just 15min from the town center of Fairbanks, but you'll feel like you are in the middle of the Alaskan Wilderness. The view literally stretches hundereds of miles in multiple directions. From your bedroom you will be able to see the distant Neighboring city of North Pole, and beyond that, the entire Alaskan Range dominates the landscape. 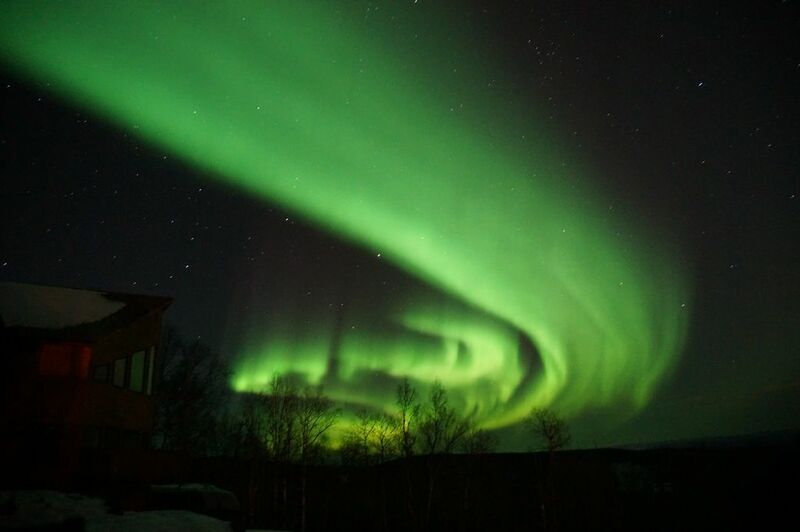 At night, watch the amazing Aurora dance in the sky...right from your bed! This 1,000 sq/ft unit (above the garage of the main home) has a private entrance, private Washer & Dryer within the unit, Jetted Tub, and an open spacious layout. Save money by cooking your own meals in the well equipped kitchen. I can not over emphasize the view. You will wake up every morning, with all of Interior Alaska stretched before you. Whether you want to pick our wild blueberries in the summer, see the many moose that wander through our yard, or observe the legendary Northern Lights that will dance over your head, you won't find a better place to explore Alaska from. Call us or email for more info. This property is unique in the fact that it is only minutes from town, but provides the seclusion and privacy you wouldn't get at a hotel or B&B. You can come and go as you please, make a meal in the fully-equipped kitchen, get your laundry done, and rest up for all the Alaskan adventures that await you! Privacy, amazing view, jetted tub, full laundry room and kitchen. Beautiful bathroom, just outside the Master Bedroom, with a Jetted Tub. *No wifi avalible, but guests are able to use 3G/4G on their cell phones. Verizon and AT&T coverage works well. Great location for viewing Northern Lights, pretty view! Nice location and view. We saw northern lights from the house both nights. Large space, full kitchen, comfortable bed. If coming in snowy winter, rent AWD vehicle. We enjoyed our stay. It had everything we needed to be comfortable. It was cozy and the sunrise and sunset will not disappoint, amazing views. I love the location. The house is comfortable and so well insulated! Hannah and Carl have an awesome property! High upon the hill, so the view is hard to beat. The house is warm and comfortable. Cooking was a breeze! Loved my stay and will be staying again! You can also see the aurora from the house because of its location. A great place to view the Aurora Borealis in October. I brought my sister up to Fairbanks in the hopes of seeing the Aurora Borealis for her birthday, and for physical and health reasons, I specifically searched for a place where we could view from the comfort of indoors. We were not disappointed! 3 nights we were able to view the Lights and Hannah was great at alerting us when the Lights were on display. This is most likely the last trip my sister will be taking and a major bucket list item could be marked as accomplished! The place is delightful and it was nice to be just a little ways outside of Fairbanks. Oh my what beautiful views! My sis got the bedroom, and while the bed is super tall to get into, she managed to do so with ease, which is good because I couldn't manage it easily (chuckle). I immensely enjoyed walking along the lane for some fresh air and exercise. We drove the 2 hours to Denali National Park later in the week, which is stunning to go visit, even though all the shops and restaurants were closed for the season. Well worth the drive. The private, spacious, and clean apartment is over the garage and next to a young and active family residence. If the sound of family activities and children is a concern, this place might not be the best choice for you as there isn't much of a sound buffer between the apartment and the garage below or the family home next door. The full kitchen is fine for easy meals, though if you are a serious cook, as noted in other reviews, you will find it a bit sparse in utensils, large bowls and cookware. The only other thing of note is the pull-out sofa bed. I wasn't able to sleep on it because it appears to have been broken. I notified the hosts, and they worked to find an air mattress in town but had no luck during our stay. I found a solution by pulling the mattress off each night and putting it on the floor with the memory foam topper on it. A minor inconvenience to set up and then put away each day, but delightfully quite comfortable for sleeping. All-in-all a nice location to stay and have as a home-base for visiting the Fairbanks area. We enjoyed staying in this quiet, mountain view home. Hannah was very helpful even texting us to see if we had everything we needed. Wish we had more time to stay longer. Recommend this beautiful home.